It's important to have your copyright information included with every photo that goes out into the wild. Fortunately applications such as Aperture and Lightroom enable you to add copyright information during upload, making it easier to develop this healthy habit. But what can you do if you don't use those applications and sometimes forget to append your files? You can have your camera do it for you. IPTC data readout from Adobe Bridge 2. 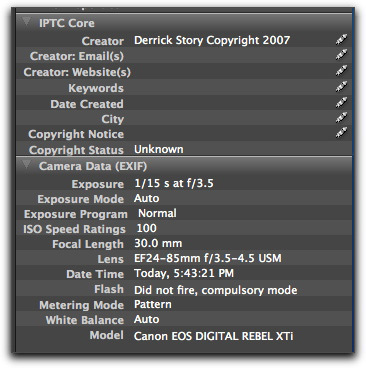 The text in the "Creator" field was added by my Canon Rebel XTi during capture. That's right, Canon DSLR owners can apply up to 30 characters of text to the metadata of every picture they take. This information appears in the "Creator" field when read in Bridge, in the "Author" field in Photoshop, and the "Owner Name" field in Preview. So even though it shows up in different IPTC fields in different applications, it does show up. I even added an image to iPhoto, then exported it out, and my copyright persisted through the export process. Start by making sure you have the latest version of EOS Utility 2. Launch it, then connect your Canon DSLR. Once the application recognizes your camera, click on "Camera Settings/Remote Shooting." If the application doesn't recognize your camera, disconnect it, change the communication setting to "PC" (in Canon's set up menu), then reconnect. Now click on the Tools icon and enter up to 30 characters in the "Owner's Name" field. You can't use symbols, so you'll have to spell out "copyright." Click OK, and you're set to go. Now, every time you take a picture, the info you entered will appear in the metadata of the picture. This information persisted through every test I could throw at it except for one: "Save for Web" in Photoshop, which strips out all metadata. My advice, don't ever use Save for Web for your images. 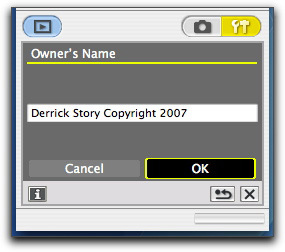 But do set up your Canon camera to write your copyright information to every photo. I'm guessing that Nikon and other DSLRs offer similar capabilities. If you use one of these cameras and know how to apply this technique, please post in the comments field. From first hands experience I can tell you that the Nikon D200 has a similar feature: Image comment. Difference is the field being used. Instead of the forementioned "Author" field, the "Comment" field value is set. And if you want to modify your EXIF, there's EXIFtool GUI. Thanks for the tip about EXIFtool. The main thing here is to label your images the best you can as early as possible in the process. I like the idea of my name being added to the photo at the moment of capture. Getting it to persist is the problem. Using regular "Save As" in Photoshop preserves the camera-written metadata. But I'm seeing that Lightroom and Aperture, for example, don't include that field when they export out of the app. That might not be a problem since you've already added a real copyright at that point. But I would prefer that these apps honor the metadata I've added and carry it forward. Well, I downloaded Nikon's Camera Control Pro and was able to make the changes in that. I don't have a dSLR (yet), but that's a pretty nice feature for on the spot. I've been using iWatermark for doing Copyright/IPTC. As I mentioned previously, I don't have a dSLR. However, I am using Canon's now-defunct P&S flagship - the PowerShot Pro 1. While I don't have the EOS Utility, I opened ImageBrowser to see if anything similar could be done. I may have stumbled upon it, but won't be able to see if it works until the next couple days. File > Canon Camera > Connect to Camera > Confirms/Changes camera settings (clicked on the tool icon). I typed in my name similar to what you did in the box for "Owner's Name". It looks like this works with P&S's as well. I just checked the info on one of my photos I took last weekend using ImageBrowser and my copyright showed up in "Owner's Name". I was using a Canon PowerShot Pro 1. Thats a pretty good information.... thanks for sharing it ..
is there anyway to add your name to photos already taken before entering your own name? i have a few great shots and i want to attach my name. 3.0-inch LCD monitor and more. conversion for outstanding color tones and gradations. top speed 1/8000, top x-sync speed 1/250. point with f/2.8 and faster lenses. I entered my copyright info in my Canon EOS 5D using EOS Utility (I have version 2.3) as instructed above. The copyright info does come up when viewing the image with Preview but does not appear in Adobe Bridge and Photoshop CS2. Any thoughts as to why? Thanks. Thank you allot, for this useful post.! but seriously, great post and thanks allot !! i look ahead to your next post !! This meal looks so tasty. I would really like to make this one at home by myself. However I don't know if I will make such a hard thing. I am not the best one in the kitchen. However I will try. Thanks for such a great recipe and keep posting them in the nearest future too. I don't understand how just adding your name and the words copyright ACTUALLY COPYRIGHT ANYTHING AT ALL. Don't you have to file a application for each photo with the US Copyright Office? All of your pictures are automatically copyrighted to you without having to file a copyright with the US Copyright Office. However, if you put it on your photos, most places require the person getting the prints to have written proof that they can use the photos and then they have to sign a document stating they have the right which basically binds them to only using the pictures if they have the rights to them.